It appears towards the end of Jane's latest video that one of the rock spires is nearing completion, as the wooden decks have been removed from the working structure around it. Maybe it's just temporary to check the consistency of the rock finishes, but I suspect that they are about to cut off all of the supports and do the final touches on it. What does seem odd is that they have removed all levels of the planks at one time. When they were working on Carsland, they started at the top and removed the decks and supports a level at a time so they could finish the patches as they worked their way down. Maybe all of this patching work will be done from a boom lift. It's possible that the planks were removed temporarily due to the high winds that occurred this week..
Now a third SILA video taken 1/23/18, this is the SWGE construction as viewed from the Mark Twain. Jane is getting more creative with the music, I like it. The view of the rock work from the Rivers of America is becoming more amazing by the week...always something to look forward to. 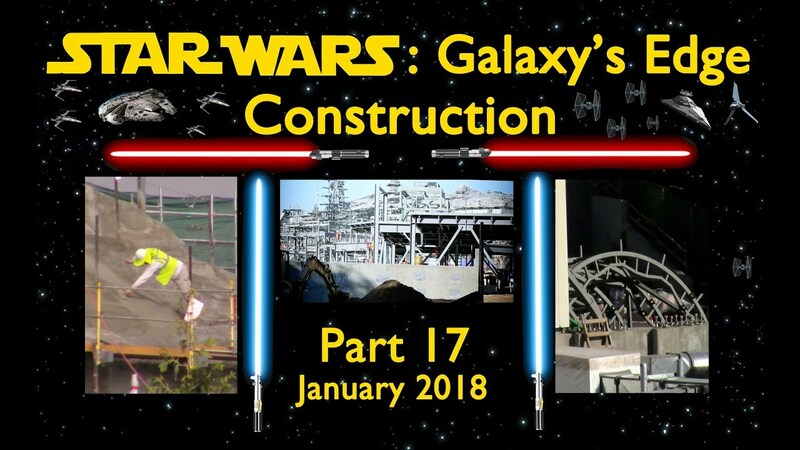 The latest fantastic video from Yensid 55 documenting the SWGE construction for January 2018 step by step. It's very enjoyable to watch these videos from Mark and his daughter Megan. Mark obviously does quite a bit of research regarding the various construction elements and also does a great job explaining the progress using dissolves and updates from different points of view, week to week. I also like the way they compare the current construction progress to the SWGE model giving us a point of reference to understand just what we are looking at. 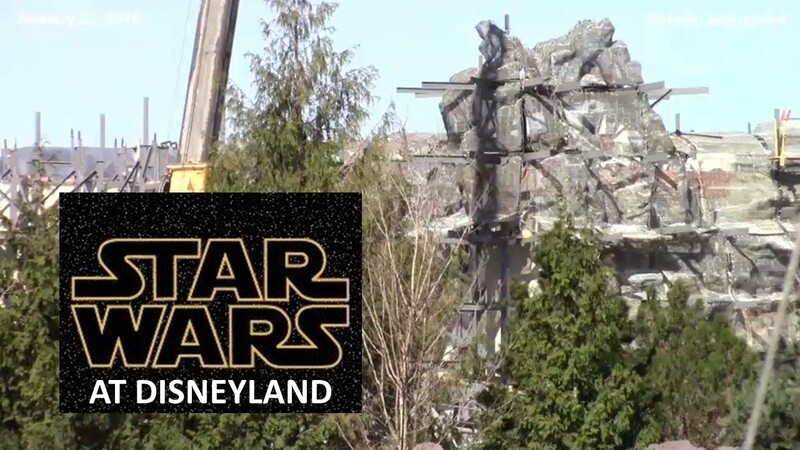 This video shows the development of Star Wars Land (aka - Star Wars: Galaxy's Edge) at Disneyland during January 2018. I was just going to suggest the same thing. Nobody wants a six foot section of 2x12 to get blown down and land on whatever or whoever. I've seen someone get hit by a large plank falling from a scaffolding just a couple stories tall. It wasn't pretty. Was it just me or did it seem like they were able to get a completely still shot from the Matterhorn? Maybe they have a little bit of special access? I wonder if the picture taken why going up the lift hill. If that's the case, would it help if one entered from the TL side or FL side of the Matterhorn? My guess would be it's one single frame from a video taken while riding on the Matterhorn, on which track I don't know. I do know that Mark and Megan explore all possibilities for viewing the SWGE construction and that is one of the many reasons I find their video so enjoyable to watch. Nawww he just films it at a high frame rate or shutter speed to he can pull stills from the video with little to no motion blur. Watch just before at around 16:30 where he takes the shot through the gate on the tram. Same thing, he just didn't show the video first on the Matterhorn. He's got a good camera. There's only one lift hill on the Matterhorn (either side) and it's indoors. My guess is that he found an opening near the top that was pointing toward SWL and filmed in that direction. I'll be honest. At first their videos kind of annoyed me because it felt they were talking down to us like we're all little kids. But I've since completely changed my view. The amount of work they put into these videos is extremely impressive and they are always incredibly illuminating. And it seems each month the videos become more innovative in terms of shooting locations and comparisons to the model. I now look forward to the end of each month because I know a new video from them is coming! A new SILA video taken yesterday 1/31/18 viewing the SWGE construction from the Hungry Bear. The SWGE rock formations are starting to create a very interesting backdrop for the Rivers of America...I'm liking it. With all of the construction workers standing, seemingly looking towards the camera, at one point, it reminded me of one time when Macro was taking pictures of the WoC construction and two of the workers held up a 'Hi Macro' sign. Last edited by BiggestDisneyFan; 02-02-2018, 02:07 PM. I remember that very well, Marco was the best at taking pictures of the World of Color construction process! Good job, that must have taken a bit of time! Surprisingly not. I threw in the keywords of "Hi Macro", "World of Color", "Micechat" into Google and it came up on the first page of results. I can't believe that was more than eight years ago. My how time flies. With World of Color I was so close to the workers they couldn't help but see me. Many of them would roll their eyes when they noticed me. I imagine they were thinking "There's that dork again." 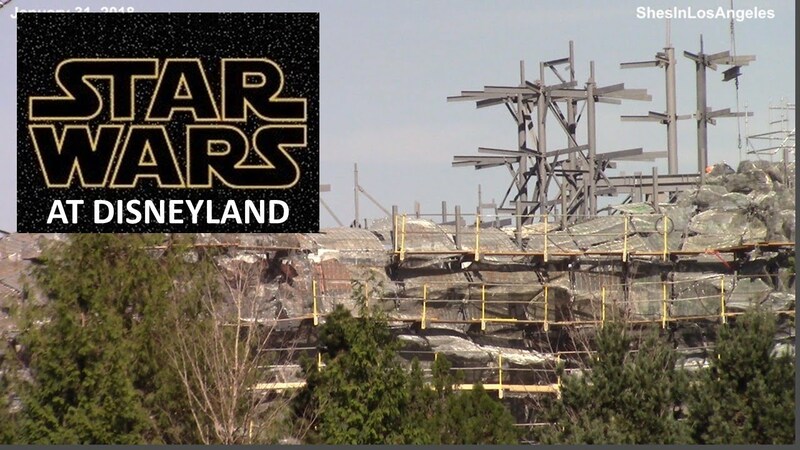 These Galaxy's Edge videos are being taken with some major zoom lenses from a significant distance so anyone shooting those should be relatively safe from detection. Last edited by Macro; 02-03-2018, 06:16 PM.